Can I use a wireless controller without the Wireless Gaming Receiver for Windows? Can I use the 360 controller with a game that doesn't explicitly support gamepads? Buying a controller? Or something else? 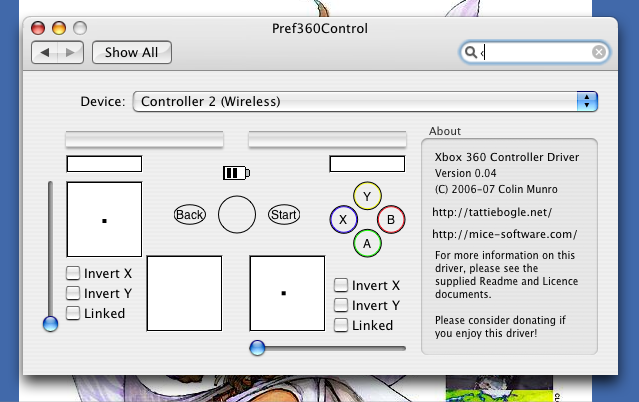 I have created a USB driver which allows you to use wired XBox 360 Controllers via USB, and wireless XBox 360 Controllers via the Microsoft Wireless Gaming Receiver for Windows, on your OSX machine, including support for the Apple Force Feedback library. The driver is licenced under the GPL. I have got the Microsoft ChatPad working with my wired controller. The latest release of the driver includes support, and I'll be updating the USB information section of this website shortly. I've not yet checked the wireless receiver for compatibility. Sadly, my PowerMac has died, which as my primary development machine has slowed progress. I have added a version of the driver without support for the Guitar Hero controller, to allow the Guitar Hero for Mac game to work (it attempts to access hardware directly, which doesn't work if a real driver has claimed the device). It works by automatically tweaking the driver's Info.plist, but a reboot will be required after any changes. The Driver disk image contains an installer, which when run will install the driver, and a Preference Pane to control it. If you find the driver does not work for you, please attempt and find out as much as you can about the device, preferably using the Apple "USB Prober" application provided with the developer tools, but the output of System Profiler for the device may be enough. E-mail it back and I'll try and work with you to get it working. Driver needs to handle more possible errors. Sadly, the wireless controllers communicate with the XBox 360 using a propreitary RF protocol, and not Bluetooth, so the Bluetooth module built into your Mac won't help you out. Additionally, the Play n Charge cable only charges, and won't allow you to use the wireless controller as a wired one. If you want to buy a Wireless Gaming Receiver from Amazon, use the links below and part of your purchase will be donated to me! If you're using a game like WoW or an emulator that only supports the keyboard, I recommend ControllerMate to allow you to configure any HID device to appear as another device to the system. In addition to this, there are applications available if you want to generate a MIDI feed from your controller for creative purposes! The driver should also now be able to update itself to support (or remove support for) any given devices, using the new + button to the left of the connected device list. A deadlock issue was present that causes any HID devices (e.g. keyboard and mouse) to freeze if the wired controller has been unplugged, in relation to the ChatPad support code. Someone kindly submitted a patch to temporarily remove the deadlock in 0.11. I've released a version which will hopefully install and work fine on 32-bit Snow Leopard. It also contains 64-bit binaries, however I've been unable to test them because Apple have disabled my MacBook from booting into 64-bit mode. I have however been informed that 64-bit and 32-bit builds are both working. The driver should work with MacMAME, and indeed many users have used it successfully. However, I've not yet tried it myself and so Google will be your first stop. If, after looking, you can't get it to work, you can still try e-mailing me at the link at the bottom of the page. I'm told you need to upgrade to version 1.5 of Halo before it will accept gamepads. Install the update, and I'm told it will work perfectly. If you're looking to buy an XBox 360 controller to use, or any other Amazon items, please consider using these links.